© Copyright 2004, From The Wilderness Publications, www.fromthewilderness.com. All Rights Reserved. This story may NOT be posted on any Internet web site without express written permission. Contact [email protected]. May be circulated, distributed or transmitted for non-profit purposes only. [Under the radar of almost every environmental and energy-study group, The Christian Science Monitor reported on Feb. 25, 2004, "At least 94 coal-fired electric power plants - with the capacity to power 62 million American homes - are now planned across 36 states." As FTW has long predicted, oil and gas shortages would inevitably lead the US into short-term, knee-jerk, reversion to coal and nuclear options as means to put proverbial fingers into the leaking energy dike. MAY 27, 2004 1100 PDT (FTW) -- As many people with even a casual interest in energy now know, natural gas supplies in the United States are very tight and will most likely become worse due to mature gas reservoirs no longer being able to meet demand. The National Petroleum Council (NPC), an industry organization established by the U.S. Interior Secretary in 1946, announced in a September 2003 report that U.S. and Canadian gas production has "plateaued" and that North America will no longer be self reliant in meeting its gas needs.1 There currently exists only one source of proposed salvation for meeting American gas demand, and that is importing Liquefied Natural Gas (LNG) from other countries such as Oman, Qatar, or Algeria. There is currently a large effort in this nation to rapidly increase LNG imports but safety and environmental concerns are greatly slowing down this effort. In addition, competition for LNG from Japan, Europe, India, and China may very well limit the amount we can ultimately obtain. The oil situation may turn out to be just as bad, if not worse. Studies conducted by petroleum geologists such as Colin Campbell2 and L.F. Ivanhoe3 suggest that conventional oil production will peak sometime before 2010. While this claim was at first ignored by most mainstream media, it can't be ignored any longer. Petroleum prices have reached record highs; oil production has peaked in individual countries including the U.S., Britain, and perhaps Oman; and it's now commonly recognized that Saudi Arabia is the only country claiming excess production capacity. Ever-increasing numbers of former skeptics agree that oil production may peak during this decade. We live in a world that was built and is sustained by inexpensive, readily available fossil fuels. Fossil energy powers our delivery vehicles and all of our farm machinery, it pumps water to our homes, it produces nearly all of the products that we call chemicals. In short, without fossil fuels our civilization cannot exist as we currently know it. Figure 1 shows the percentage of various energy sources used to run American civilization from 1920 to 2002. It can be easily seen that natural gas, petroleum, and coal make up the vast majority of American energy demand and that as petroleum and gas consumption have risen or fallen, coal has done the inverse. This is because coal is the only real alternative for gas and oil. Some might argue that there could be other sources of energy and they would be right but we are simply not ready for them. Nuclear energy can be used to generate electricity and can even make motor fuels, but safety concerns, waste disposal issues, and needs for further technological development mean that nuclear energy will not be a majority energy source for several decades. Hydroelectric power has served the U.S. well but is now near its maximum potential because there are simply almost no rivers remaining to be dammed. In addition, water shortages have affected the reliability of hydroelectric power. Wind power has a moderately promising future but the unreliability of wind has limited its use throughout the world. Even countries such as Denmark that have made heroic efforts to develop wind power are connected to a larger electrical grid so that they can rely on more traditional sources of electricity when the wind is not blowing. There are also other energy sources such as solar power but they are very minor contributors and will remain so for reasons that are beyond the scope of this paper. In short, the only major energy sources for the next few decades will be oil, natural gas, and coal. Another item to note about figure 1 is the peak in gas and oil production that occurred in the 1970s which led to the resurgence in the percentage growth of coal. If indeed we are nearing a point in which the U.S. will find more difficulty in obtaining oil and natural gas, then only coal will be called upon to fill the shortfall. There is almost no doubt that coal production will rise in the future and the Department of Energy's Energy Information Administration (EIA) predicts that coal consumption will greatly increase in the next two decades.4 Most would agree that this will not be a problem because in the U.S. we have hundreds of years of reserves remaining. Years of reserves remaining is easy enough to calculate: one only need determine how many tons of coal remain in the ground (available from the EIA) and divide by the production for that year. If we look at the year 2000, we can see that we have 255 years of coal remaining. However, if we look at other years, we see something strange: there were 300 years of coal reserves in 1988, 1000 years reserves in 1904, and 10,000 years reserves in 1868! As each year goes by, we use our coal more quickly and we see that the standard formulation of 'years remaining' is nearly meaningless. 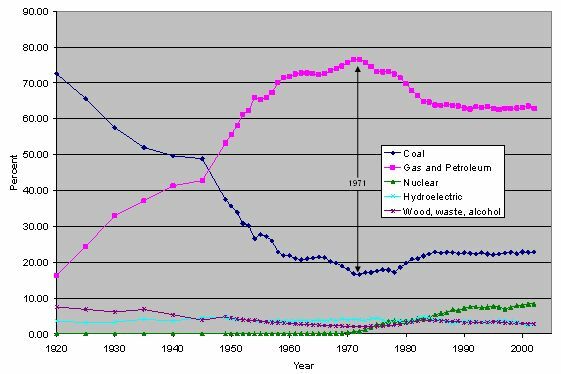 Figure 2 shows U.S. coal production from 1800 to 2001. 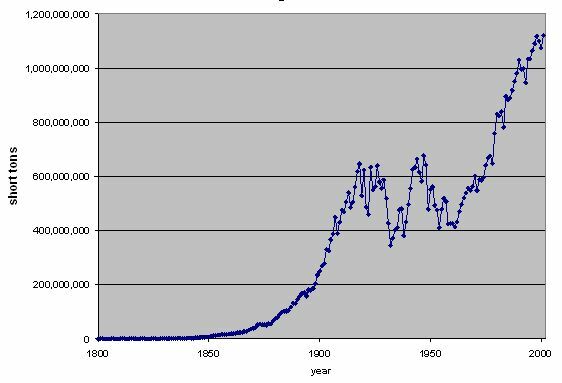 We can see a fairly good example of exponential growth with a change in that pattern from 1917 to 1961. This deviation from exponential growth teaches us an important lesson about projections. Any mathematical model that involves human decision such as whether to use coal or oil, or models that include the chaotic, human driven economy will deviate from mathematical perfection. Any model that we devise will only be a decent fit at best. One model that has been fairly successful at predicting the production of oil and gas is the Hubbert curve. 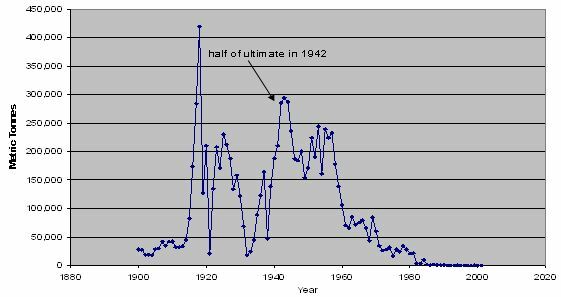 It is a bell shaped mathematical curve very similar to the normal distribution curve and is named after the now famous geophysicist M. King Hubbert who used it to predict that oil production in the 48 contiguous states would peak in the early 1970's. 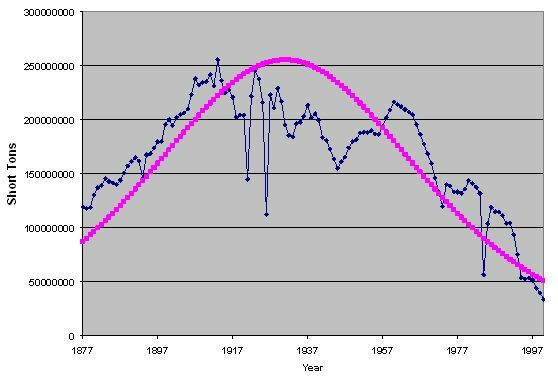 Hubbert was proven to be right when production peaked in 1971. Figure 3 shows a Hubbert curve that has been fitted to coal production data for the United Kingdom. The U.K. was chosen as an example because it is a region that is well past its peak and will likely never be able to increase its production to British coal's heyday in the early parts of the 20th century. Britain has already shown us that a region's coal fields can be depleted, but we must ask whether the Hubbert curve is a good depletion model. It seems to work fairly well for British coal but this sort of analysis is traditionally used for oil and gas. A review of the U.S. Geological Survey's databases shows us that there are at least two resources that have experienced depletion. Figures 4 and 5 show U.S. production for Arsenic and Manganese. The Hubbert model predicts that a resource will peak when ½ of the ultimate production (the total amount that will ever be produced) has been produced. For arsenic, we see that the production peak occurred exactly in the year that the model predicts. 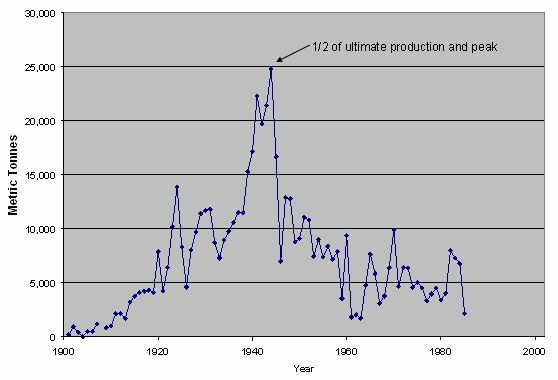 As for manganese, there was an early peak in 1918 but then production went back down not because of geological constraints but due to human decisions. However, we see a second production peak in 1943 that is only one year after the peak predicted by the Hubbert model. It is probably too early to definitively say whether the Hubbert model can be used for coal production in the U.S., but the examples of British coal, U.S. arsenic, and U.S. manganese seem to indicate that a Hubbert curve may be able to predict future production trends for U.S. coal. A full paper will be published at a later date explaining how the Hubbert curve was fit to U.S. coal production data, but the results can be seen in figure 6. The fitted curve takes into account past production trends and predicts the peak date based on the assumption that once one half of the ultimate has been reached, production will naturally decline as the remaining coal lies in thinner and deeper seams. 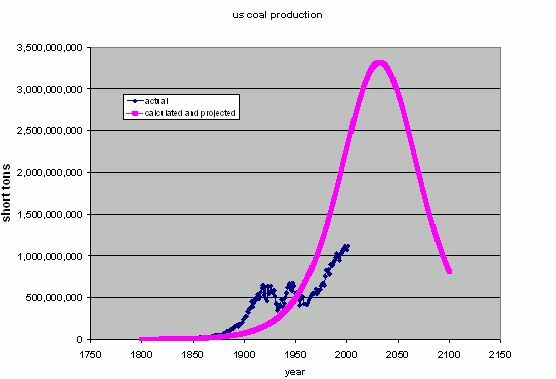 In this fitting of the Hubbert model, the date of peak coal production is forecast to be 2032. If we look at figure 6, it might seem that the Hubbert curve does not closely match the historic data but that is because of the variable nature of historic growth. The full paper gives details describing analyses that argue that the fitted curve does indeed match the historic data. Some critics have argued that Hubbert's curves are really just curve fitting which is partially true but the Hubbert model also takes into account remaining and original reserves which are determined using geological knowledge. Perhaps a better method could be used to predict peak production that takes into account future supply and demand of energy. It is possible to estimate future demand given certain assumptions and much as with the Hubbert model, assume that coal production will peak when ½ of original reserves have been depleted. The first scenario investigated assumes that future coal demand will exactly follow the EIA's Annual Energy Outlook 2004. Using the EIA's assumptions, coal will peak in 2060. However, The Annual Energy Outlook 2004 was published before it was widely accepted that U.S. gas production had peaked and that growth of LNG would be difficult. If we assume that U.S. gas consumption cannot grow beyond 2002 levels (2003 gas consumption was less than 2002) due to the North American gas production peak and limited LNG imports, then growth in electrical demand must be met by coal instead of gas. In this second scenario, coal is forecast to peak in 2053. The final scenario assumes that in addition to flat natural gas consumption, oil will peak in 2010 and synfuels will be produced from coal for use in vehicles. It is further assumed that these synfuels will be produced using the process currently employed by the Sasol Company in South Africa. While this is a rather inefficient process, it has been proven at large scales over many years. In this scenario, coal is forecast to peak in 2035. A summary of the results for these three scenarios and for the Hubbert model can be found in table 1. The question is whether these three supply/demand scenarios are optimistic or pessimistic. The majority of the calculations were conducted at Carnegie Mellon University in the Fall Semester of 2003 before the severity of the gas crisis had become obvious. It is possible that gas consumption in the U.S. will not remain flat but will actually decline; in this case, the coal peak will come sooner. In addition, none of the three supply/demand scenarios looks at coal use for various industrial processes or coke production. Recent interviews with coal and rail companies have revealed that metallurgical coal demand in the Spring of 2004 has been unexpectedly high. If industrial coal demand does increase, this will also cause coal to peak at an earlier date. There is a significant difference between the forecast from the Hubbert Model and the three supply demand forecasts which raises the question of which is more accurate. The Hubbert model relies heavily on assuming that future growth will be similar to past growth and this may be correct in that the Hubbert model predicts an average annual growth rate for U.S. coal of only 1.2% between 2000 and 2032. With economic growth and possible declines in natural gas and later oil, even 1.2% annual growth in coal consumption might be too conservative. In conclusion, is there any hope that the coal production peak can be pushed back to a later date? The various models described above, all assume that current trends will continue along a certain path, but we can decide to change the way we consume energy. There exist technologies such as coal gasification that produce electricity and even synfuels much more efficiently than current methods. We can also make efforts as a nation to conserve our resources and perhaps even conclude that endless growth may not be in our best interests. It is probably safe to assume that coal and economic growth will be closely tied in the next few decades meaning that we can either have long lasting coal supplies or economic growth, but not both.